ok, I've asked this before but still can't get it. 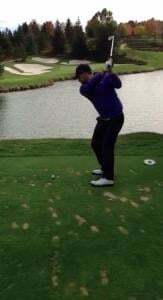 How do you finish with the club going behind/accross the ears like Hogan/ Tiger? I know great players (Nicklaus/Norman) finished with the club more vertical but thats not what Im after. How and why is this accoplished? Any input is much appreciated. thx! Huh? So do it that way instead. Flexibility probably is a limiting factor. If I'm corrrectly understanding what you're asking A.G., swing the club as if the forearms are tied together, they will "fold" mirroring each other by the time you finish balanced on the left side with the right foot on it's toes. Keep in mind that a proper setup is the key to all and with that said, a good balanced finish = a good golf swing. Finish is not something you do. It is a result of how you are swinging and how you rotated. Forcing the club to a spot because it's aesthetically pleasing is asking for all sorts of trouble. I finish that way and could pose for a picture in my follow through, but couldn't break 85 to save my life right now. I'd take Arnold Palmers follow through right now to hit it better. I do feel that I swing the club down the line better with a follow through that mimics Nicklaus' over the shoulder type follow though though. I started using this type of finish to combat pushes (on my own) and it only turned my miss to a pull. My opinion is that Monte is exactly right that the followthrough is a result or everything that goes before it. That said, I do think that focussing on a very balanced finish (regardless of your technique) is of great benefit. As a small side note, my personal favourite drill is the following which has always helped my followthrough and overall balance (it's actually a couple of different drills which I just threw together into 1). Take both your right index finger and thumb off the club so only your three other fingers of your right hand are gripping the club. Set up with your feet together (heels touching) and make and swing ensuring your right index finger and thumb stay off the grip through the motion and that your grip pressure remains light and constant. Hold your finish position until the ball lands (or a count of 5). Aesthetics of the swing are beyond irrelevant to how good your ball striking is. If you saw Palmer, Nicklaus, Trevino, Player, Johnson, Furyk, JB Holmes, Bubba Watson, Tommy Two Gloves, etc. and didn't know who they were, you would say their swings were terrible. I walk up and down the range and see all of these pretty looking swings with perfect finishes and see how they are approaching impact and laugh at how bad the swings are. As a matter of fact, I make fun of "scratch finishes" on my blog all the time. "Oh, you need a more perfect looking finish." Sorry for the rant, but having a pretty swing has become more important that hitting the ball well and it really is frustrating to me at times. To be fair, balanced is not the same as "pretty" or "scratch". Allow me to elaborate a bit- giving the readers the benefit of doubt to know that proper fundamentals being of the utmost importance. Setup, posture, tempo et al. Sometimes all one needs is to finish the swing. IF any swing "thought"- simply thinking of a balanced finish alone can allow the golfer the freedom to swing the golf club through the ball. and that balanced finish completely on the left side (for RH) will equal a good shot nearly every time. 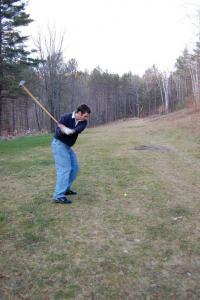 But I look at the golf swing not as hitting the ball, but swinging the clubhead through the ball. Turning from the center of our torso over a stable base with all parts connected- not with just the arms and hands but from the center of the torso and from the ground up with the arms hands and club all connected to. I think a good finish can be good to train balance but solid impact is the most important! What did you shoot? I had my first lesson with a TGM instructor last Saturday and could not play with the exact swing you show there. Drives were low hooks and my punch irons never had the distance to get there as I was constantly 200yds out from poor drives. With that said I hit the center of the face almost every hit! Guess that doesn't really matter when you shoot a 51 on the front and just stop keeping score because of more of the same on the back. 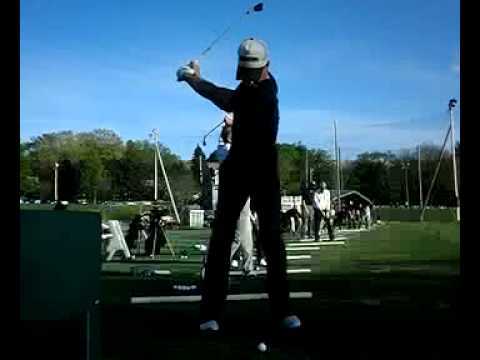 I'm thinking that there is something connected with my vertical club finish (and a left arm chicken wing,) and a flip or incorrect hand position at impact. I understand your frustration. We have all been there. I just don't want you wasting energy on something that is unlikely to help you. Post a video. I bet you get at least one or two responses that will be helpful. Monte with all due respect neither of us know what the OP's swing looks like. It very well could be as simple as finishing the swing. Of course there are underlying issues, however if the OP has solid fundamentals yet struggles with releasing the club properly due to a missed weight shift, the mere thought of finishing the swing can free him to release properly. I do agree- post a video. I don't totally disagree with what you said from a feel standpoint. However, my response was to his original post which was basically he didn't like the aesthetics of finishing one way and preferred to finish a different way because it would look better. A.G. I think your logic is good. Working backwards can sometimes be helpful. I’ve done the same thing trying to get to that Hogan finish. I learned golf taking it too far inside with the club head inside the hands. From there I could not get to that finish because I had to throw my arms out to 1st base. My path was too in to out resulting in a high hands finish. I’m getting better slowly. Having said that I have not had much luck trying to copy someone’s swing. (I’d like to hit iron shots like Snedeker) I volunteer in my small town to teach juniors in the summer. They all over swing and try to kill it which of course results in chunks, tops, and whiffs. What works is getting them to hit solid chip shots. I’ll demonstrate a short chip, then a medium one and then a long one and so on up to a full shot. Once they feel solid contact they get it. I’ve found that this works not only for my juniors but really improves my contact as well. thanks everyone. I'm trying to post a video, although not best quality. again thanks to all! That's fair and I agree with that. We are all individuals - no two alike. If I tried to copy anyone elses swing to the letter, the frustration would be never ending and there's a good chance that I may never find my own swing. I mentioned the mirroring forearms to prevent disconnection- the "flying elbow". If you fully release the hands and arms at impact or right after, and have very steep shoulders through the ball, a high finish will be the typical result because the club face will take the lead of the hands while the head is travelling down the line. If you keep your hands and club more connected to the pivot through impact and beyond (less release, more real time force), you will get a deep finish. You need a relatively strong grip, a flat shoulder turn and a few other things to achieve that. Check the slicefixer thread for a stroke pattern with a Ben Hogan deep finish.